Combining several images into one bigger image seems to be a center of research in the last years. Microsoft Research released multiple applications that combined several images of the same object. 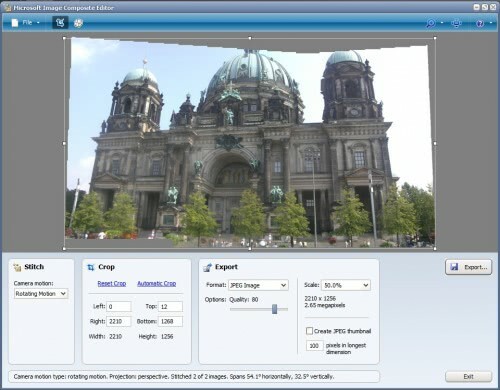 The latest release from Microsoft Research is called Image Composite Editor which can create a panoramic image from multiple images of the same object. The program is very easy to use. The user needs to pick at least two images of the same object which are then processed automatically by the image editor. An error message will pop up if the software program was unable to compute the new panoramic image. If the process is successful the new image will be shown in the program's interface. Several post processing options are available to manipulate the newly created image further. The user can choose one of five camera motions, crop functionality like automatically cropping the image and image projection. The image can be exported in various formats including jpeg, tiff, Adobe Photoshop psd and the HD Photo Image format. Microsoft Image Composite Editor is a nice tool that can combine multiple images of the same object into one larger image of the object. This is great for objects that are to large to fit in one picture taken with the digital camera but also for detailed images that should be combined. Microsoft Image Composite Editor was tested on a Windows XP Service Pack 3 test system. It should run fine on other Microsoft operating systems and comes as a 32-bit and 64-bit version. Doesn’t Windows Live Gallery do that VERY well too? This is a new greatly improved engine when compared to the Windows Live Gallery with many more features relevant to the photographer such as the ability to choose projections and to export in formats such as PSD and silverlight. Although I have Adobe Photoshop and I love WLG. The link is in the first paragraph of the review.